For the 2015 John Moyle Memorial Field Day Contest I headed down to Parnka Point at the Coorong National Park, about 170 km south east of Adelaide. The Coorong National Park qualifies for the World Wide Flora and Fauna program (it is VKFF-115) and also qualifies for the VK5 National and Conservation Parks Award. The park’s name is thought to be a corruption of the local aboriginal word kurangh, meaning ‘long neck’, which is a reference to the shape of the lagoon system. The name is also thought to be from the Aboriginal word Coorang, “sand dune”, a reference to the sand dunes that can be seen between the park and the Southern Ocean. 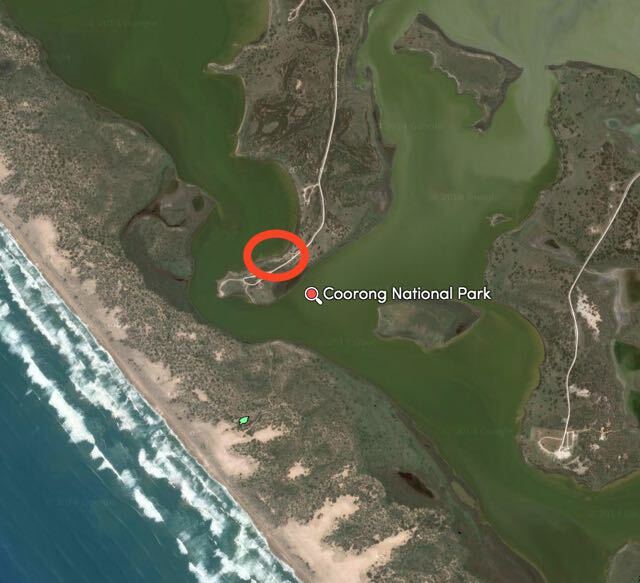 More information on the Coorong National Park can be found at….. I drove to the end of Parnka Point and set up in a little shelter shed on the western side of the point. Parnka Point is the narrowest part of The Coorong as the water is less than 100 metres wide. 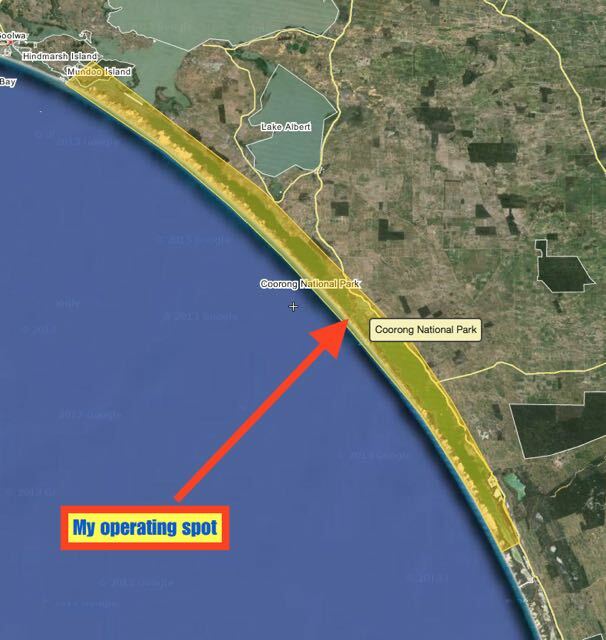 Parnka Point is where the northern and southern lagoons of The Coorong meet each other. The water at this point is often referred to as Hells Gate. The northern lagoon is partly fed by the waters of the River Murray, and varies in salinity from brackish to hyper saline. In contrast the southern lagoon is always hyper saline. While this narrow channel often appears calm, a change in wind direction or water levels can create treacherous currents through this narrow but deep channel. Parnka Point was a significant meeting site for the five aboriginal tribes that formed the Ngarrindjeri clan. Parnka is a Ngarrindjeri word meaning ‘sandy beach’. As you look out across the lagoon, you can see wooden poles in the seater. These are the remains of a ferry built last century to access the Younghusband Peninsula. It was a very beautiful outlook, overlooking the lagoons. The weather was sensational…..28 degrees C.
I took part in the 6 hour section and I managed a total of 238 contacts. Most of those were on 40m SSB (222), but I did squeeze in 26 on 20m SSB. Most of the contacts on 20m were with other VK’s, but a few Europeans and Japanese gave me a call, and exchanged numbers. They were obviously aware of the JMMFD. For the contest I used my Yaesu FT-857d and 40 watts on 40m and 80 watts on 20m. The antenna was a 40m/20m linked dipole supported by a 7 metre telescopic squid pole (inverted vee). The radio was powered by a 44 amp hour power pack(2 x 22 amp hour SLAB batteries) which I topped up with the use of some solar panels. I used my laptop for this activation and Mike’s VK Contest Log. But the inverter which I had purchased to connect the laptop to via the power pack, threw off S8 noise. So I had to take some breaks from the radio, to charge the laptop. I probably ‘gasbagged’ a bit for the first few hours, telling people a bit about my location and what equipment I was using. This is what I like about the JMMFD. You can take it easy or take it very seriously. At tea time, I sat back and enjoyed the magnficent sunset and a glass or 2 of red with my evening meal. And then back into it until about 9.00 p.m. SA local time when I packed up and headed home. Friday the 13th March 2015 was another ‘Summer’ activation event, so I headed over to the Charleston Conservation Park (CP), which was recently added to the World Wide Flora Fauna (WWFF) program. Charleston CP is now allocated as VKFF-777. 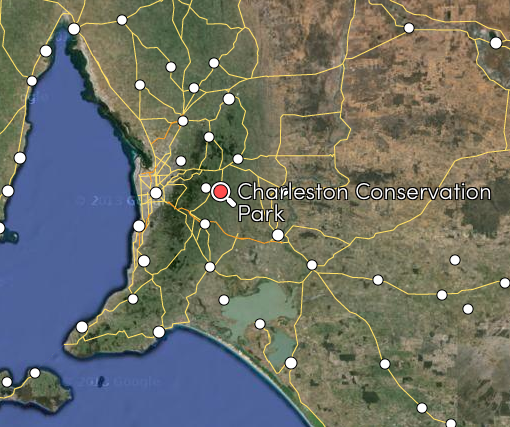 Charleston CP is located about 46 km east of Adelaide. It is located near the little township of Charleston. The town was named after Charles Newman, who left Sommersetshire in England in July 1837 under engagement to the South Australian Company as a shepherd. 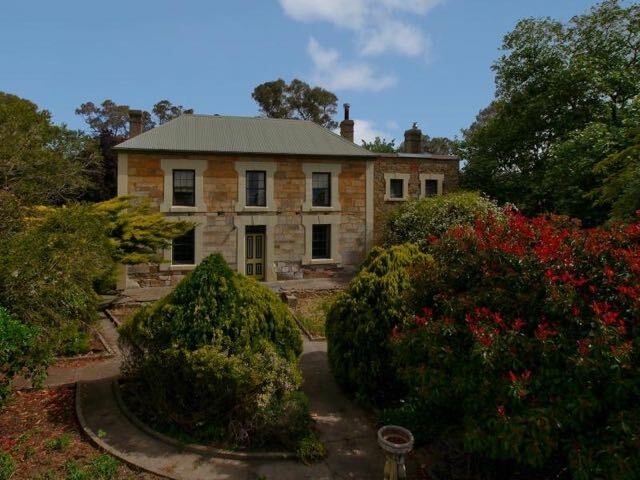 In 1843 he took up land in the vicinity of Mount Charles and built a home there. To this day, the Newman homestead remains on Newman Road at Charleston. I managed to find a video of the homestead, from Adcock Real Estate when it was up for sale back in 2012. And here is an extract from The Advertiser, Wednesday 3rd October 1990 re the death of Newman. I have activated Charleston CP a number of times previously, but this was the first time I had activated the park as part of WWFF, so it was quite exciting. For more information on my previous activations, click on the links below…..
Charleston CP is just a short distance from my home. It is a very pleasant drive through Nairne, and on towards Woodside. I then travelled along Pfeiffer Road passed the Country Fire Service Air base. Six (6) single engine AT802 ‘Air Tractors’ are based at Woodside. These aircraft are manufactured by Air Tractor Inc in the United States and have a cpacity to carry 3,200 litres of water/fire retardant. A number of helicopters are also based at Woodside. I set up just inside Gate 1 on Bell Springs Road, at the north western corner of the park. There is another entrance to the park at the north eastern corner, however it is a little heavier wooded at that location. So I chose to set up at Gate 1 again as per my previous activations. 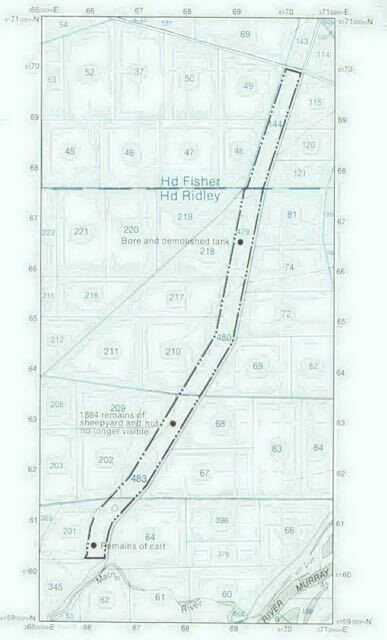 This is a track here which runs along the northern boundary and another track which runs along the eastern boundary. The scrub is quite thick, so I walked about 30 metres inside the boundary fence and found a clearing and set up the 40m/20m linked dipole, my deck chair and fold up table. For this activation I again ran the Yaesu FT-857d at 40 watts. My first contact was with Andrew VK1NAM who was portable on SOTA peak Isaacs Ridge, VK1/ AC-041. Andrew had a nice strong 5/8 signal coming in from eastern outskirts of Canberra. After working Andrew I tuned around the 40m band and found my first VK5 Park. It was John VK5BJE who was portable in the Scott Creek Conservation Park, another recently added park to the WWFF program. 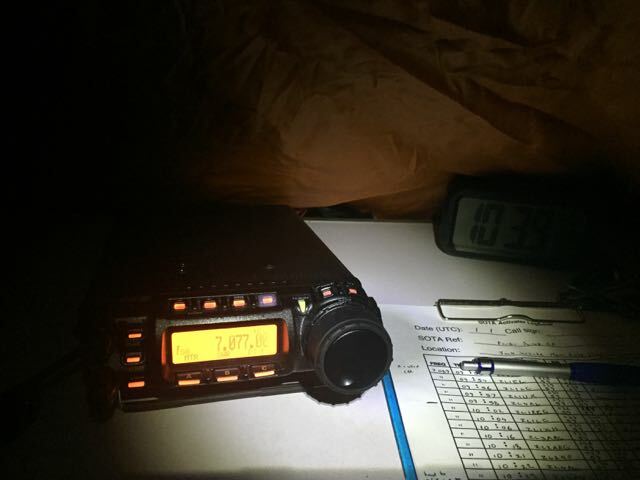 John had a very good 5/9 signal coming in from Scott Creek CP, VKFF-788. I then found Arno VK5ZAR on 7.105. Arno was in the Ferguson Conservation Park in the eastern suburbs of Adelaide near the foothills of the Mount Lofty Ranges. Arno was running QRP 5 watts and a linked dipole and had a strong 5/9 signal. Arno is one of the regulars who always gets out on a Friday evening. I then tuned up the band and found Peter VK5FLEX calling CQ on 7.115 from the Pike River Conservation Park near Renmark in the Riverland region along the Murray River. Peter has recently been bitten by the ‘parks bug’ thanks to Larry VK5LY. My next park contact was with Geoff VK5HEL who was portable in the Ettrick Conservation Park in the Murray Mallee. Ettrick CP is a recently gazetted South Australian Conservation Park. Geoff has also recently become a regular park activator. I then spoke with Peter VK5PET who was operating from the Ferries McDonald Conservation Park in the Murray Mallee. I was very pleased to make contact with Peter as this was his first ever park activation. Well done on getting out there Peter. I then propped on 7.110 and started calling CQ. It wasn’t long before I had a small pile up of ever keen park hunters. My first taker was Peter VK5KPR, followed by Doug VK2FMIA who was in the Horton Falls National Park, VKFF-594. If you would like to see Doug’s excellent blog and read about his activation at Horton Falls, please click on the following link…. A few QSOs later I was called by David VK5NQP who was operating portable from the Cromer Conservation Park near Birdwood in the Adelaide Hills. 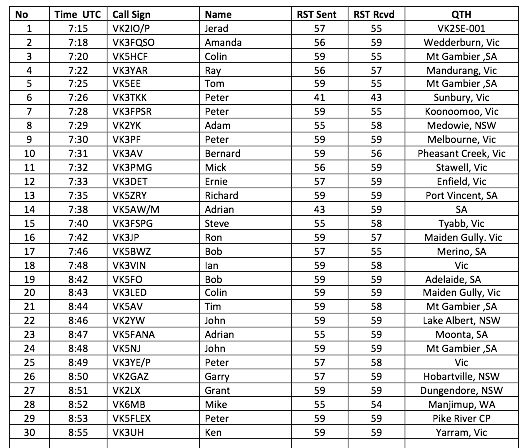 And a number of QSOs later I was called by Les VK5KLV in the Mount Remarkable National Park in the north of South Australia. When things got a little quiet, I tuned around the band and found Adrian VK5FANA operating portable from the Bird Islands Conservation Park on the Yorke Peninsula. Adrian was running QRP, just 5 watts, but nether less had a beautiful 5/9 signal. Adrian is another amateur who has recently renewed his interest in the hobby by activating from South Australian parks. It is great to see the Foundation calls getting involved. I then settled on 7.100 and started calling CQ and this was answered by Gordon VK5GY who was operating portable from the Kenneth Stirling Conservation Park in the Adelaide Hills. Gordon was also running QRP 5 watts and was a good strong 5/8-9 signal. I worked a further 6 stations in VK2 and VK5, but when things slowed down a little I took the time to try 20m but conditions there were not at all good. I put out a number of CQ calls but had no takers. So I headed back to 40m and put out a CQ call on 7.105 and this was answered by Brian VK5FMID in Mount Gambier, followed by Adam VK2YK with a very strong 5/9 signal, and then Rob VK4FFAB. A steady flow of callers from VK3, VK4, & VK5 followed. I spoke with Peter VK3PF who advised that there was a VK6 SOTA station a bit further up the band on 7.130. So I headed up to 7.130 where I made contact with Phil, VK6ADF who was portable on SOTA peak Mount Desmond, VK6/ SG-011, north of Hopetoun in Western Australia. Phil was quite a good signal, however there were some Japanese stations on frequency which caused me to loose the occasional word (4/6 sent and 5/7 received). I then returned back down the band to 7.105 where I spoke with Colin VK4FAAS and Mike VK6MB. At 0936 UTC (7.06 p.m. South Australian local time) I booked in to the 7.130 DX Net where I worked into VK3, VK5, VK7, French Polynesia, and New Zealand. Whilst I was on the net, the sun was setting in the west, and the native bats had come out. There were a number of them flying in very close proximity to where I was set up. I was certainly hoping that their eyesight was good as they quickly darted through the air. After a few rounds on the Net I headed up to 7.150 where I put out a few CQ calls and this was responded to by Steve VK3NSC, Steve VK3FSPG, and Shaun VK5FAKV. But despite conditions being very good, it was very quiet on the band. So I had one final tune around the band and found Steve VK5SFA calling CQ. Steve’s signal was very strong and was literally lifting the FT-857d off the table. I was happy. I had reached the 44 QSO threshold for the WWFF program, and had a total of 59 contacts in the log. I have received a few queries as to how I log contacts in the field. I use a handwritten log when I am out portable in a park or on a summit. It is A4 in size and fits onto a plastic clip board folder. I use a bulldog clip down the bottom to stop the paper from flapping around in the breeze. I have tried electronic logging with my laptop and my tablet. However I find the handwritten way the easiest as I can also quickly scribble down call signs, names, and notes, etc. I also started off using small notebooks but I soon found that these were too small in size. When I return home I use Fast Log Entry (FLE) to enter those contacts and create an ADIF file. I have mentioned FLE many times before, and I highly recommend it. You can find FLE at….. I then upload that ADIF file to my electronic log which is MacLogger DX. 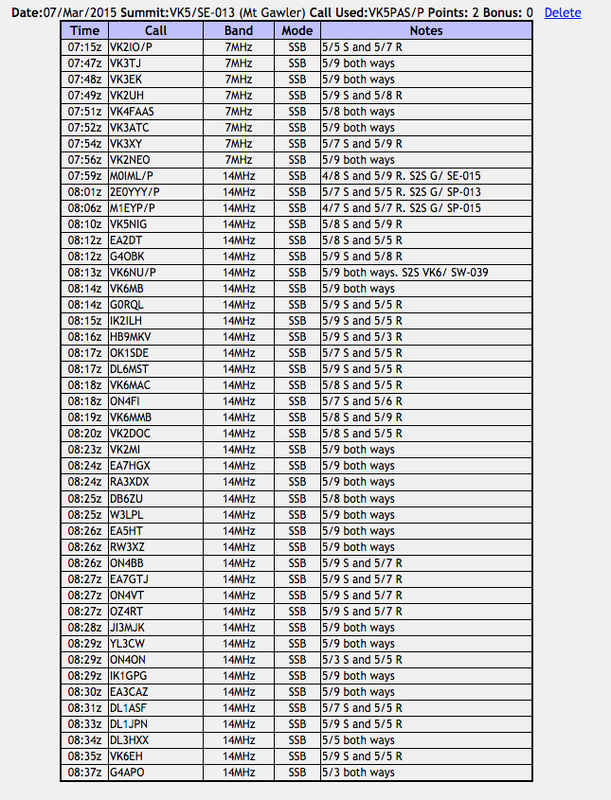 John M0UKD has a page on his website dedicated to printable amateur radio logbooks. A selection of these can be found on M0UKD’s website can be found at….. 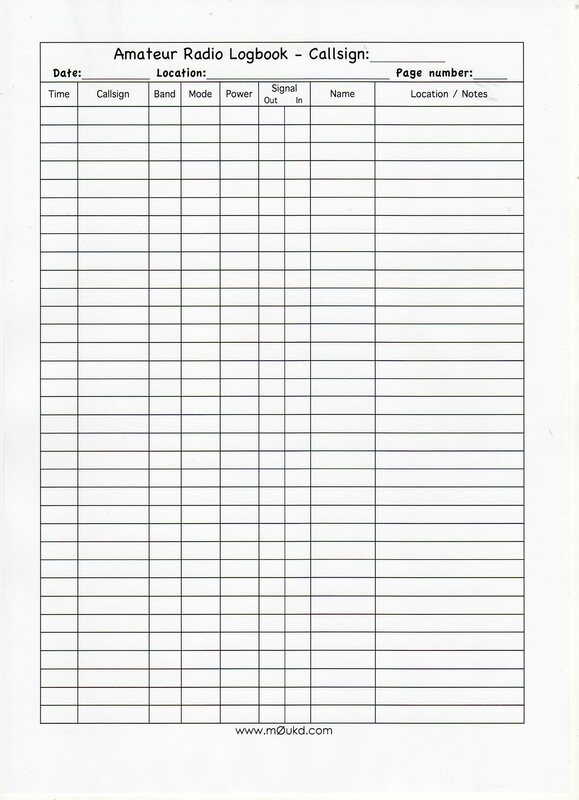 I have placed a copy of the sheet that I use in the Files section of the VK5 Parks Yahoo group. 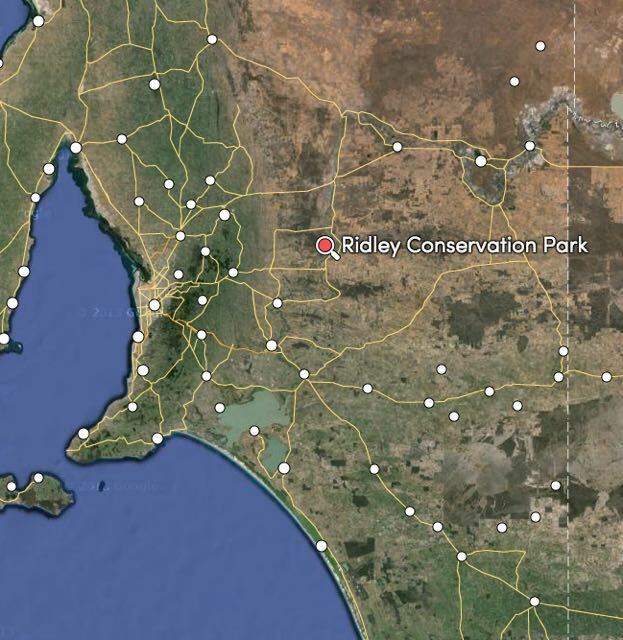 My second park for Sunday 8th March 2015 was the Ridley Conservation Park, which is situated about 120 km north east of Adelaide and 10km south of the little town of Swan Reach on the Murray River. I had intended activating the Ngaut Ngaut Conservation Park on the Murray River, which would have been a unique park, but my request to access this park was declined by the Mannum Aboriginal Community Association. I will be writing a letter seeking future access and I will keep everyone posted of progress. So after leaving Marne Valley, I headed east out along the Black Hill Road, which follows the Marne River. This is quite a pretty drive. I encountered quite a few Western Grey kangaroos and a paddock of goats. I couldn’t help but stop to take a photo of the SOTA mascots. 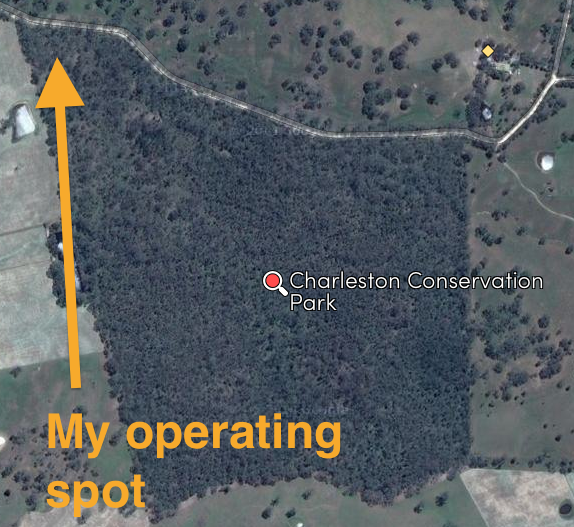 I have activated the Ridley Conservation Park a number of times previously. For more information on those activations, please click on the links below…..
Ridley Conservation Park is a long narrow park. It is 10 km in length and about 400 metres in width. It covers an area of about 414 hectares and . The southern boundary of the park is on the edge of the valley of the Marne River. At this location is Hayward’s Hill, which is the highest point in the park. 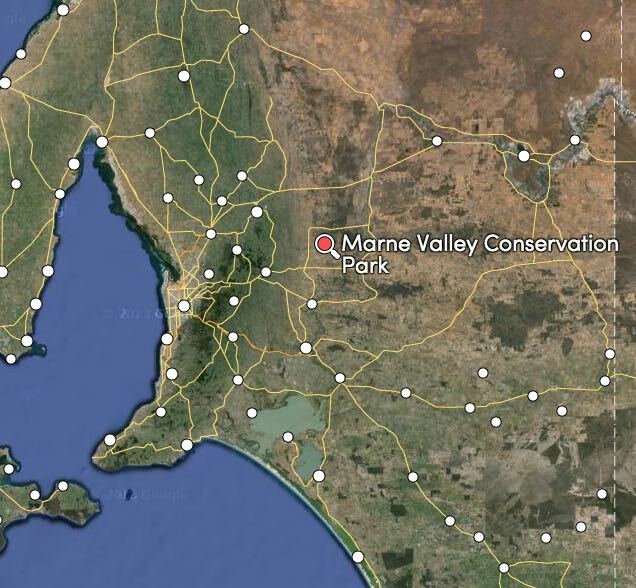 The remainder of the park comprises flat country typical of the limestone plains of the Murray River. Image courtesy of National Parks and Wildlife. The park is home to a large variety of native mammals and birdlife. This includes the Southern Hairy-nosed Wombat, Western Grey kangaroos, Echidnas, Mallee Ringneck parrots and Mulga parrots. The park was originally part of a Travelling Stock Reserve (TSR) which ran for roughly 5-10 kms parallel to the Murray River. The reserve linked the stock market of Burra to the north with Murray Bridge to the south. By 1878, the TSR became obsolete with the completion of the Morgan to Adelaide railway. By 1901, an approach was made to the Department of Lands by local land owners to resume the TSR land and for it to be made open for allotment. In 1901 and 1907, proposals to this effect went before Parliament but were declined. In 1934, the then District Council of Caurnamont contacted the Director of Lands and requested that the TSR be resumed for allotment. The council claimed tat the Reserve ‘harboured vermin’ and was a ‘drain on council funds’. And then in 1937 further requests were made for the Reserve to be used for grazing. Inspector Klau of the Crown Lands Department inspected the Reserve in 1939, and following his inspection, recommended that the area not be resumed. Between 1938 to 1940 there were numerous requests to cut wood in the Reserve for charcoal burning. One of these proposals was to clear 28 hectares of the Reserve, north of Haywards Hill. The Ranger at the time, described the Reserve as ‘an asset to the State‘ and he declined these requests and stated that the land should remain in its uncleared condition. During the mid to late 1950’s, following further requests, Annual Licences were granted for grazing purposes within the Reserve. And then in 1966, land was being resumed and purchased for the purpose of National Parks. It was at this time that the Land Board proposed that portions of the TSR ‘be retained and dedicated as a Wildlife Reserve under the control of the Commissioners of the National Parks and Wildlife Reserves at the expiration of the current Annual Licences’. ‘Although a long narrow strip of land such as this is not the ideal shape for a National Park, the idea of preserving natural vegetation and bird habitats by setting aside portions of the Travelling Stock Reserve is an excellent one and the area under investigation is suitable for this purpose‘. The park was officially dedicated as the Ridley National Parks Reserve in May 1968. It was later gazetted as the Ridley Conservation Park. Although it is outdated (1984), there is an excellent description of the park and the history of the area in the publication entitled ‘Conservation Parks of the Murraylands (Western Plains) Management Plans’. Please see below….. I set up on the western side of the Murraylands Road, between Sunnydale Road and Sleeper Track. I ran the Yaesu FT-857d, 40 watts and the 40m/20m linked dipole for this activation. After setting up I called CQ on 7.095 and this was answered by ever reliable parks hunter, Mick VK3PMG in Stawell in Western Victoria. This was followed by another keen park hunter, Adrian VK5FANA, then Arno VK5ZAR, followed by Greg VK5ZGY. The 40m band was in excellent condition and a steady flow of callers followed, from all across Australia: VK2, VK3, VK4, VK5, and VK7. The local time was about 6.45 p.m. (0815 UTC). There is no doubt that this is when the 40m band is at its very best. I went on to work 32 stations around Australia. At 8.00 p.m. local time (0930 UTC) I booked in to the 7130 DX Net where I worked a total of 6 stations including Andy VK4TH/8, William FO5JV, Gary ZL3SV, Brian ZL2ASH, and Adrian ZL1GBG. At times the net can run a little slow, so I took the opportunity of having a quick look around the band, and I found Greg W8GAP calling CQ on 7.180. I decided to give Greg a shout and surprisingly got through without much difficulty. Greg was an excellent 59 signal to the park. Initially my signal was 44, but it came up to a 55 and Greg was able to copy all of my information without any difficulty. After a few rounds on the net I checked out, and went up to 7.135 and called CQ. My CQ call was answered by Drew VK2FROX, followed by Ian VK3FIAN, and then Bob VK3FLAK running QRP from his EFE40 transceiver. It was during this time that a tour bus came through, with the driver operating a spot light. Obviously looking for native wildlife. But what they found was some crazy guy sitting out in the middle of nowhere in a deck chair alongside a squid pole. I wonder what the tourists were thinking? I had one final tune around the band and found John K1GUN in Maine, calling CQ on 7.140. I gave John a call and had a good QSO (5/9 sent and 5/5 received). So after a very pleasant evening in the Ridley Conservation Park it was time to head home. I still had an hours drive ahead of me. I had a total of 48 contacts in the log, including some good DX QSOs on 40m. On Sunday (8th March 2015) I was left all alone. My wife Marija and her mum left early that morning for 3 nights at Broken Hill. So while the girls are away, the boy can play radio. I headed to the Marne Valley Conservation Park, which is situated about 30 km north of Mannum, and about 10km south east of Sedan. I reached the park by travelling from home to the historic town of Mount Torrrens, and then through to Birdwood. I then travelled to Cambrai, which is a little town just to the west of the park. The Marne Valley Conservation Park covers an area of about 105 hectares and it is bisected by the Marne River. The park was dedicated in 1976 and consists of gently undulating land, with much of the park comprising of low lying, seasonally inundated river red gum flats. The surrounding countryside was cleared of most of its gum trees during the late 1880’s and a saw mill existed in the area. The local red gum was considered ‘superior’ to many other varieties of gum for use as railway sleepers. The park is home to a large amount of wildlife including Western Grey kangaroos and waterfowl. It was certainly alive with kookaburras during my activation. The Marne River which passes through the park was once part of the main Adelaide to Sydney stock route. The River was previously known as the South Rhine River. However, as was the case with many place names here in South Australia, the name was changed in 1917 as Australia was at war with Germany. The River’s name was changed to Marne after the Marne River of France, where the German advance was halted in 1914. The South Australian Marne River’s headwaters are centres around the Eden Valley and Springton areas, and it passes through Cambrain before flowing into the Murray River at Wongulla. Prior to being called the South Rhine and then the Marne, the river was originally known by the local Ngarrindjeri aboriginal people as Taingappa, meaning ‘foot track-trading road’. The Aborigines used the river as a route up into the hills to trade with the Peramangk aboriginal people in the Barossa Valley, and to cut bark canoes from the River Red Gums in the hills which had thicker bark than those near the Murray. The nearby town of Cambrai was also known as Rhine Villa. It is reported that there was once a house or hut with a comical villa front in the area and a person named Skinner occupied it and called it ‘The Villa’. The little township grew up around it and got the name of Rgine Villa, due to the proximity of the Rhine River. The name was changed to remove any connection with German place names and it was named after the Battle of Cambrai in France during WW1. Last year, two elderly bushwalkers became lost in this park and a major search was launched. See the article below…. Prior to heading to the park I referred to the Marne Valley Conservation Park Management Plan which is dated 1994 and is horribly out of date. It refers to a visitor access track running along the western boundary from the south to the picnic and camping area. I was unable to locate this. The gate which I did find on the southern side of the park, off Black Hill Road, was locked. A familiar find at most South Australian Conservation Parks. Locked gates. I set up on the southern side of the park. Access here is very easy. The boundary fence is in very poor condition and can easily be stepped over. There is even an old National Parks and Wildlife ‘Reserve’ sign on the gate which appears to have been there since the dim dark ages. I set up the fold up table and deck chair and ran the Yaesu FT-857d and 40 watts for this activation. I used the 40m/20m linked dipole supported on the 7m squid pole. I used a wooden fence post to secure the squid pole to, with the assistance of an octopus strap. I could not get on to my nominated operating frequency of 7.095 due to the Kandos Net still going, so I headed up to 7.105 and called CQ. This was immediately answered by Mick VK3PMG in Stawell, followed by Phil VK5XR, Marc VK3OHM, and then Adrian VK5FANA on the Yorke Peninsula who was running QRP 5 watts (5/8 sent and 5/9 received). I worked 9 stations in VK3 and VK5 and it then went very quiet. So I took the opportunity of going for a 20 minute walk through the park. After coming back from my walk I called CQ again on 7.105 and this was answered by Arno VK5ZAR, followed by Peter VK3PF and then Gary VK5PCM who was running QRP 2 watts (5/7 both ways). I went on to work a further 18 stations in VK2, VK3, & VK5 until it slowed down again. I tuned around the band and found Rod VK2TWR who was portable on as part of the Summits on the Air (SOTA) program. After working Rod, I heard a few stations asking me to QSY up the band. So I headed back to 7.105 where I was called by Bernard VK3AV, Grant VK2LX, Phil VK5RM and then Andrew VK3ARR. I worked a further 4 stations, before deciding it was time to pack up and head off to the Ridley Conservation Park. Wikipedia, 2015, Marne River, <http://en.wikipedia.org/wiki/Marne_River_%28South_Australia%29&gt;, viewed 10th March 2015. On Saturday afternoon (7th March 2015) I drove around the corner to the Mount Barker Caravan Park and met up with Tom VK5FTRG who was staying at the park for a few nights. Tom is from Millicent in the South East of South Australia and was in the area with his family. Tom got a ‘leave pass’ and we headed for nearby Mount Gawler VK5/ SE-013 so that Tom could undertake his very first SOTA activation. Tom and I headed north through the Mount Lofty Ranges and into the recently bushfire devastated Sampson Flat region. A total of 38 houses were destroyed during this fire which raged for a number of days in early January 2015 (2nd January – 9th January). The fire blackened more than 12,500 hectares (31,000 acres). To give you an idea on the size of the fire, have a look at the image below. 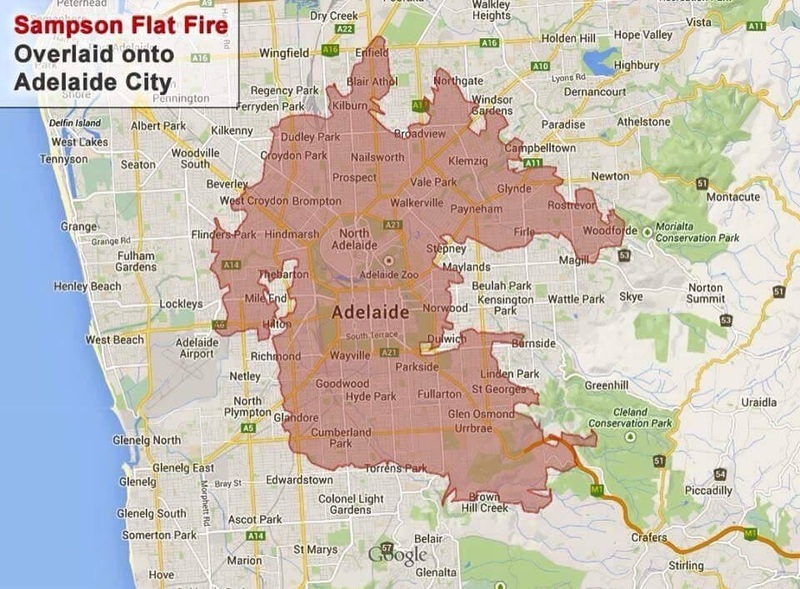 It is an overlay of the fire on the city of Adelaide. It really puts the size of this fire into perspective. And below is a video of the scar that this fire has left on the landscape. The trig point for Mount Gawler is located on land owned by Noel and Anne, who have always kindly allowed amateurs access to their property. A few weeks after the fire I visited Noel and Anne to see how they were travelling. Fortunately their house was spared during the fire. At the time of my visit to Noel and Anne, I was very saddened to see the state of the area. What was once beautiful native forest, was gone, including the beautiful Mount Gawler Forest. But Tom and I were very pleased to see a lot of regrowth just a month or so later. There is a long way to go, but at least many of the gum trees were starting to show regrowth, and what was completely black parched land, was now starting to show some green. I had phoned Noel, earlier in the day seeking approval to operate from the trig point. So when Tom and I arrived at Noel’s property, he had kindly left the gate open for us. As this is an easy summit to access, Tom and I employed the ‘walk out and walk back in’ method. We got all our gear together and then walked south down one of the gullies for a few hundred metres and then climbed back up hill again into the activation zone. We then set up at the trig point, supporting the 7 metre squid pole in a squid pole holder with the assistance of an octopus strap. For this activation we ran my Yaesu Ft-857d and the 40m/20m linked dipole (inverted vee). For Tom, we obviously ran at 10 watts, and whilst I was on air I used just a little under 40 watts. To power the radio I used a LiFePo battery. We made ourselves comfortable on some large moss rocks which are located at the trig point and Tom started calling CQ, after I had spotted him on SOTAWatch. It wasn’t long before Tom had his first SOTA pile up going. And I enjoyed sitting back watching Tom in action. The only time I picked up the mic was to get a Summit to Summit contact with Gerard VK2IO who was on top of Canoelands, VK2/ SY-001, just north of Sydney. After Tom had played on 40m a bit, I put out a few quick calls on 40m and worked 7 stations in VK2, VK3, & VK4. We then lowered the squid pole and removed the links in the dipole, and then re-erected the squid pole. I was hoping to work a bit of DX and in particular some of the DX SOTA activators that were heading out that afternoon/evening. I tuned around the band and soon found Barry M0IML calling CQ from Cheriton Hill, G/ SE-015, which is located in southern England. Barry was an excellent signal, but unfortunately he was being knocked around by contesters. That weekend was the ARRL DX Contest. Netherless, Barry was an excellent 4/8. I then worked Mike 2E0YYY who was portable on SOTA peak, Gun, G/ SP-013 in the Southern Pennines Region in England. Mike also had a very good signal. He was 5/7. Not quite as strong as Barry, but still a very good copy. The 20m band seemed to be in very good shape. And my third DX Summit to Summit contact was with Tom M1EYP who was on top of The Cloud, G/ SP-015, also in the Southern Pennines Region of England. Tom also had a good strength 7 signal, but he too was being beaten up by the contesters, so I could only give him a 4/7. I then went to 14.302 and called CQ and my first taker was Nigel VK5NIG, ‘Mr Mount Gawler’ himself. Nigel lives in relatively close proximity to the summit and is a regular activator of Mount Gawler. Nigel was kind enough to spot me and this resulted in a steady flow of callers from Europe, the United Kingdom, the USA, and Japan. All had excellent signals. I also managed my fourth Summit to Summit contact for this activation. This time with John VK6NU who was portable on Mount Randall, VK6/ SW-039, in the South West of Western Australia. In about 30 minutes on 20m I managed a total of 38 contacts into VK2, VK5, VK6, USA, Japan, England, Spain, Italy, Switzerland, Czech Republic, Germany, Belgium, Russia, and Latvia. I was very happy, and handed the mic back to Tom, who worked a number of stations back on 40m. Whilst Tom was on air, I headed down and said hi to Noel. Tom and I then enjoyed a quick snack on the summit and enjoyed a spectacular sunset, before packing up and heading off to the Bedford Hotel at Woodside where we took part in some liquid refreshment. Tom worked a total of 30 stations on his very first SOTA activation. Last night I activated the Cromer Conservation Park, about 7 km north of the little town of Birdwood in the Mount Lofty Ranges. It is about a 25 minute drive north from my home qth. The nearby town of Birdwood, formerly known as Blumberg, is famous as it is the home of the National Motor Museum. The park is situated about 50 km north east of Adelaide. I have activated this park a number of times before (2013 & 2014). 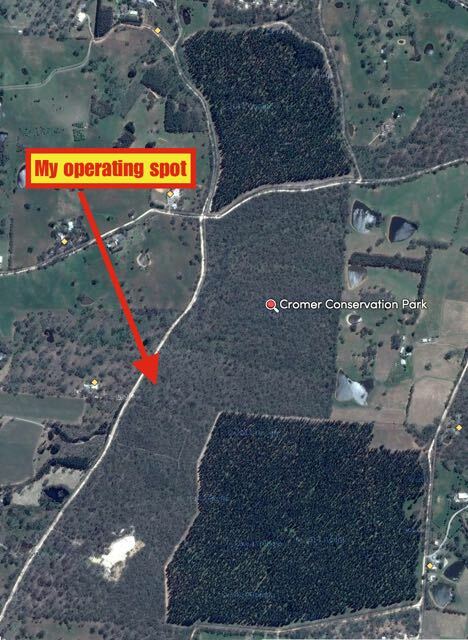 Click on the links below to read about my prior activations…..
Cromer Conservation Park which was proclaimed in 1976, is about 50 hectares in size and conserves a remnant parcel of vegetation. The park represents one of the largest contiguos native remnant vegetation parcels within the Upper Torrens catchment area. It is home to a large amount of native animals and birds. And I saw quire a bit whilst I was in the park including Western Grey kangaroos and emus. Wild deer are also found in the park. I headed for my normal operating spot which is just inside gate 1 off Cromer Road, just pass Lucky Strike Road. Although the scrub within the park is very thick, there are some cleared areas here and a track, so there is plenty of room to stretch out a dipole. I had inadvertantly left my squid pole holder at home, so I improvised and secured the 7 metre squid pole to the stump of a small sheoak tree with an octopus strap. I could not get onto my nominated operating frequency of 7.095 as the Kandos Group was still running on 7.093. So I headed up to 7.098 and called CQ. My first contact was with Nev VK5WG at Crystal Brook, followed by Peter VK3TKK mobile (with a beautiful 59 signal), Col VK5HCF in Mount Gambier, and then Les VK5KLV in Port Augusta. I worked a further 6 stations from VK3 and VK5, until some VK2 stations came on on the same frequency and started having a chat. I boxed on through the QRM and continued to work a number of stations in VK3 and VK5. Clearly these guys could hear the other stations working me. I know who these individuals are. They appear to have a ‘sked’ on 7.098 on a daily basis, and they will not move for anyone and speak in Italian I believe. After working a total of 18 stations on 40m, I lowered the squid pole and removed the links in the dipole so that I could operate on 20m. 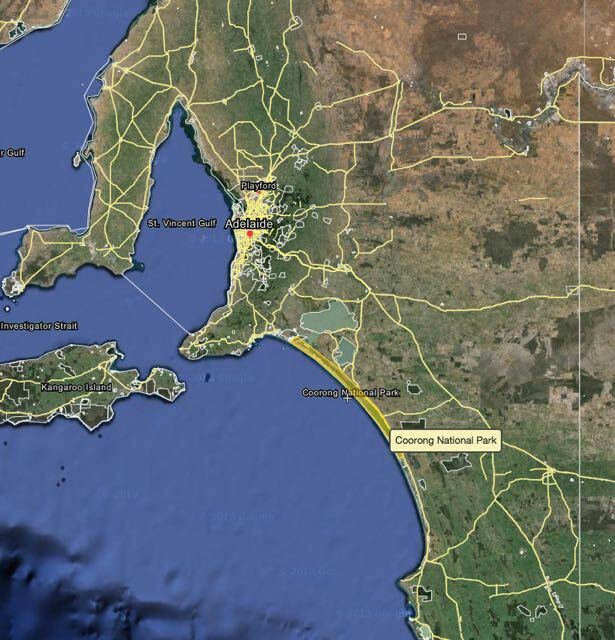 My first contact there was with VK7FG on Flinders Island OC-195, off the coast of Tasmania, who was working split on 14.260. Chris VK3FY was at the mic and had a very very strong signal. This was followed by a contact with Franc F5PAU on 14.180 who was a very strong signal from France. The band seemed to be in very good condition, so I decided to call CQ on 14.193. My first taker there was Gerry VK7GK, and this was followed by a contact with my good friend Will ON4WDL in Belgium. I met Will last year during my visit to Europe. This was followed by a call from Don G0RQL who is a regular SOTA chaser and park hunter, and then Kevin VK6AB who was portable at Albany in Western Australia. I was spotted by AK4AT and VK3PMG on the DX cluster and this resulted in quite a large pile up of stations from Europe, the United Kingdom, and Australia. I worked stations in VK2, VK4, England, Belgium, Germany, Canary Islands, United States, France, Ireland, Wales, Netherlands, Estonia, Russia, Sweden, and New Zealand. It was starting to get dark and the 20m band was closing. The wildlife was also out and about. At one stage I had a number of Western Grey kangaroos around me, along with numerous emus. I worked a total of 50 stations on 20m and then headed back to 40m where I booked in to the 7130 DX Net. Conditions on 40m were also very good. I worked a total of 12 stations on the Net including William FO5JV and Bill W1OW, and a number of VK’s and ZL. After the Net I headed to 7.150 and called CQ. This was immediately answered by Joe VK3DXJ, followed by Keith VK5FEKH, and then Rob VK2XIC. Not long after being on the frequency a JA station came up and started calling CQ. Fortunately he had no takers and moved off the frequency. But it wasn’t long before another JA appeared and this time their signal was very strong. My mate from Alice Springs, VK8GM, came up and tried to get through to the JA on multiple occasions but couldn’t seem to make it. If the Japanese station couldn’t hear Greg with his high power and good antenna, then clearly he couldn’t hear my tiny signal with my very meagre dipole. In any event, it was getting late and very cold. It was now down to 7 degrees C. So I packed up the gear and headed home with a total of 99 contacts in the log.